I’ve been involved in the gentle/natural parenting world now for almost 8 years. In that time, I’ve gone from slightly in awe of a lot of the “leaders” within that world, to cautious…or even downright unhappy. While some leaders have offered some excellent advice, many have also offered some that is awful, or even against what I thought they believed or promoted. Sometimes they simply change up the language to make it seem like it falls in line with the philosophy when it doesn’t. Since new parents are often desperately seeking assistance and don’t know where to turn or who to trust, they can be easily misled when this happens. They find a parenting leader or two who seems to have good information, and when they wade into a new area, even if the advice seems “odd,” they think, well, I trusted them on these other topics, so they must have a point here, too. That’s why we need to talk about this today. 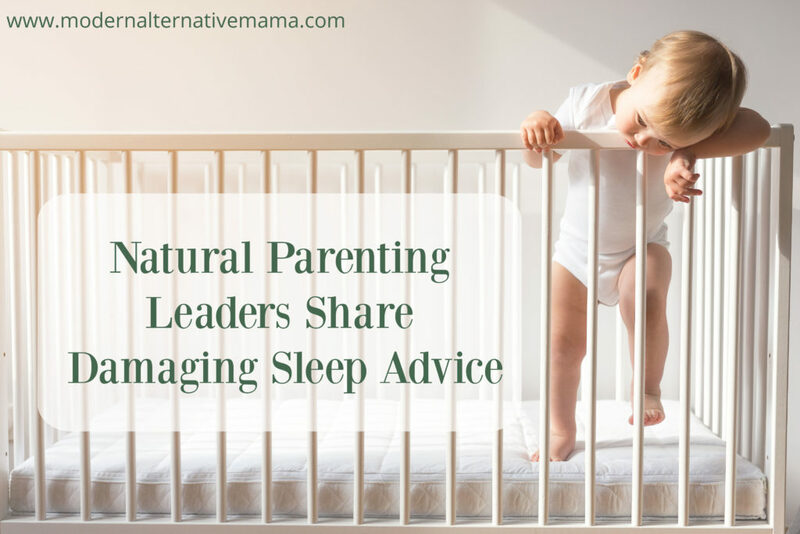 Some very unhealthy, unnatural, un-gentle sleep advice is being shared within the positive/gentle parenting community. When I first read about this, I was surprised — and hoping that it was just a one-off, unusual situation. But as I kept reading, I realized it wasn’t. This advice was being offered by several parenting leaders, in several places, on a consistent basis. This was something they were actively standing behind…and presenting as a gentle, natural option. Essentially, these leaders are promoting cry-it-out. These are parenting leaders that the gentle/natural community has trusted to give connected, healthy advice on parenting matters. And this is no different than Babywise, or other religious fundamentalist parenting advice, which most gentle parents (rightly) abhor. It centers on what the parents need and want, rather than truly looking at what the child is communicating and needing. I have learned that this is pretty central to the RIE approach by Magda Gerber. RIE plays lip service to “connectedness” and “respectfulness” but really just wants the parent to exert control over the child and the environment, and teach the child to what to expect by the parents creating a “predictable” routine. It’s entirely parent-led, and has nothing to do with what the child actually needs. This advice is damaging, because it sounds gentle, like the parent is trying to consider the child’s feelings, but really, they aren’t. I cannot recommend this approach. This is the antithesis of actual gentle parenting. How Do We Handle Sleep Troubles? In a true gentle parenting approach, if a child is not sleeping — or not wanting to go to bed — then we have to see it from the child’s perspective and figure out why. Then, we have to solve that problem in a way that both parents and child are comfortable with. “I need more sleep, so I have decided you will go to bed in this room at this time, whether you like it or not” is NOT GENTLE. First, check out these 7 Reasons Kids Don’t Sleep Well. Is there a physical cause? Certain vitamin and mineral deficiencies can make sleep difficult. So can hunger, thirst, teething pain, having scratchy PJs or being too hot or cold. Also, changes in routines or daily stress can — if the child has just started preschool, a new sibling has been born, or they have just transitioned from a crib to a bed. These things are hard for small children. And they need our support. If there’s a physical cause, address it. Meet that underlying need. Tired children want to sleep, but they may not be able to fall asleep sometimes! Once they get the support they need, they will. If there’s an emotional cause, address it. Toddlers “may not want” to sleep alone because they are truly scared for some reason! Some have fears of monsters, others have separation anxiety. Whatever the fears, they may seem irrational to adults, but they are very real to toddlers. It’s not okay to dismiss them just because we don’t understand, or recognize objectively that it’s “not a big deal.” Toddlers don’t know that! The best way to solve a sleep issue is in a way that means everyone gets the sleep they need. Bring the toddler’s bed into the parents’ room, so that they feel like they have a safe place to be. Have the toddler sleep in the parents’ bed, if needed, for awhile. Help everyone feel comfortable. It isn’t about ignoring the parents’ needs entirely; sleep is a real need! But having a toddler sleep in a separate space during specific hours is a parent’s preference (i.e. “want”), not a need. This is about balancing everyone’s needs as fairly as possible. The book No-Cry Sleep Solution by Elizabeth Pantley is a better approach — it supports co-sleeping and considers a child’s feelings and needs much better than these other leaders do. If this is confusing to you, or if you need some assistance with gentle parenting resources, please feel free to ask! I am a mama to 6 kids, and have been practicing gentle parenting for almost 8 years. I can offer my thoughts, or point you towards other resources that are truly in line with the philosophy. At the end of the day…treat children like tiny humans who matter and deserve respect. That’s most important! How do you feel about this sleep advice? I don’t agree with that advice either! My baby started doing this new thing where if you’re holding her, then go to set her down, she screams bloody murder for about 60 seconds and acts like the world is ending. Then she calms down and finds a toy to play with or just goes to sleep. But if she’s crying longer than a minute or two, I have to pick her up and calm her down. It hurts ME too much to let her cry like that! It’s a different cry than when I set her down and she’s upset because she still wants to play. Like you said, there’s usually a reason she’s upset and can’t go to sleep. It’s our job as parents to try and figure out what’s wrong because they are too little to help themselves. Sometimes though, you just can’t figure out what’s wrong. In those cases she does “cry it out”, but I’m there cuddling her at least until she falls asleep. Also, it’s not a regular thing. Usually I can figure out what’s wrong and get her to sleep, no tears involved. Thank you for offering to share advice! I am desperate to figure out how to help my 9 month old sleep better. I tried all the no-cry gentle-but-sleep-on-your-own stuff in the earlier months. At 6 months, we put him in his own crib in his own room and I spent the next three months up with him every two hours. I slept on the couch outside his room or on the floor next to his crib. Finally, I convinced my husband to let him sleep with us and it’s going better; however, naps are still horrible. I spend hours nursing, rocking, walking, singing, bouncing, sometimes jogging in the room to calm and soothe him so he can fall asleep. When he does fall asleep, I hold him until he stops twitching and is supposedly into a deeper sleep cycle before I try to lay him down. Sometimes it takes an hour to get him down for a nap and then he usually wakes up within 20 minutes crying. He always just sits up and starts crying as though he’s been deserted for forever. I do need him to be able to nap. I need my sanity. He’s been up today since 6am. I tried to get him to sleep then and at 8:30, at 10, then finally at 1:00pm he fell asleep and woke up twice afterwards, at which point I had to do all the gentle sleep guidance again.. and by the third time he woke up, I gave up and he was a fussy babe the rest of the day. He does have GI issues for which i’m doing the GAPS diet to try to heal. I love the philosophy of natural and attached parenting, but how does that apply to napping? Thank you in advance !! This is a very well written article and his the nail right on the head. I have learned that sleep, like walking, talking, etc. is a milestone and children meet that milestone at different ages and stages. My 8 year old slept through the night at 4. My nearly 4 year old still wakes 1-2 times in the night. I literally tried everything with baby #1, except for CIO. It is exhausting, frustrating, and simply awful, but we will survive and get through it, meeting our kids’ needs along the way. I have to add that every family is different in what they can handle.For example, if Mama is struggling with post partum depression, which is enhanced by the lack of sleep and is unable to care for her children or herself, she needs to do what she can to improve the situation. For me that involved the “pick up put down” method of sleep training. It took about 1 week and there were some tears the first 2 nights. After that, myself, my baby and my older daughter were in a much better place. I love my kids more than anything and I couldnt be happier to have them in my life, but in order for me to be a Mama to them at all, we need to sleep. I really dislike how sleep is framed in black and white terms. For my sanity, I can’t have my boys sleep in my room – or me sleep with them. I get angry and resentful, and become a much worse mom than if I let them cry for a couple of minutes before going to sleep in their crib. I have friends who sleep with their kids, and they love it. I think that’s powerful and lovely – and it does not make me a worse mom, or disrespectful to my kids just because I balance my needs with theirs. Janet and Lisa do amazing work, and just because you disagree with a part of what they believe, does not make them monsters saying we need to abuse our kids. You sound like you feel really guilty about your choices. That’s why you’re lashing out at me instead of addressing your own issues. If your daughter is truly crying (not just quietly grumbling or settling), then she has a need that’s not been met yet. I have discussed options here on what that might be (even though you’re rolling your eyes at my ideas, I offered them) as well as linking to another post with a lot more ideas. I would suggest, in the future, that if you feel so triggered by a blog post, that you examine why you feel that way, and find a more constructive way to respond, or ask clarifying questions. Or just scroll on! No need to yell at someone. In response to Hazel saying that if ALL the needs are met it’s okay to let the baby cry. The need to be held and comforted when feeling sad, lonely or frightened is a valid NEED unto itself. Even if all physical needs are taken care of, the emotional ones haven’t if the child is still in distress. I think it’s important to value emotional and relational needs as being equally if not more important than physical ones. Don’t you think that emotional and relational needs are important? If you do care about your child’s emotional needs and if you do care about the needs of your relationship then it might be useful to include those in your definition of all needs being met. That will require a whole re-thinking of your logic and approach though. That is a hard thing to undertake! Don’t give up when it get’s hard. Don’t let new ideas control your emotions and make you defensive. I believe you can do it! first I’m going to address this as a child not a parent …I can vividly and emotionally remember being a young child maybe 6 years old and for whatever reason , maybe I was cranky or had a disrespectful tone with my mother . I was put up in my room to take a nap !! I remember knowing right away when my words came out ” cranky ” and crying and yelling her I’m sorry..but it was stay up there , you are tired , you need a nap…I can still feel my self crying and screaming at the door ..I fully in this moment remember feeling unloved , unheard and well just bad . I couldn’t catch my breath eventually I would pass out from pure exhaustion and emotional stress ( I still pass out from emotional stress ) This is damaging to a child and frankly I’m not sure how mothers could listen to their child / baby crying ..
Last week my very spirited 6 year old daughter was picked up from daycare ..clearly unhappy and in a bad mood ..in my head I thought woah what’s up with her …I asked her on the way home are you ok , did something happen, are you just tired …oh man she was just being mean ..we walked in the house and the attitude continued ( more like frustration ) I told her she was tired and needed to relax ..she was hungry but didn’t know what to have . At this point I told her that she would have to go to her room and rest if she was going to continue to behave that way . I told her I was going to take the dogs out and then I would be back in to get her a snack . 10 mins later I came in to a quiet house and a beautiful baby girl passed out on the couch . In that moment it hit me , all the women in my family get extremely cranky when tired all of us even my mother . I was so so thankful that instead of feeling disrespected I KNEW my baby was tired ..so I gave her space and she fell asleep .. No emotional trauma ..no punishment ..No screaming until she vomits because she couldn’t understand !! This whole EXTINCTION method where you don’t enter their room until the morning under No circumstances… how ? why ? who thinks this is good for a child or any human ..your going to have children that instinctively feel that they don’t matter ..why bother talking to my mom she doesn’t care ..developmentally you will have kids that lack empathy and very well have extreme attachment disorders… to me this is neglect pure and simple . Very well written! So helpful! Great piece. I just wanted to add to the mother of the 9m old who struggles to nap… I found this the case too.. it was only until I let go of any intended routine did my LO begin to nap soundly. She eventually found her rhythm to sleep in which became her own routine. I found when my LO was tiring I “helped” her get on her way with napping as opposed to trying to enforce it. I did this by taking her out in her buggy (what ever the weather) or I’d pop her in her sling and just continue with my day. She learnt to self sooth.. not by any magic trick but just from my constant presence or the presence of another dear loved one and my day and rest time wasn’t upset from it either. We both fell into each others rhythms. I have to say that your reply to Hazel is anything but gentle and kind. Is actually quite aggressive. I’m not a mother and have no mother guilt but I do agree with Hazel, from my experience as a nanny/Aunty/friend to lots of children/parents it isn’t black and white. I read articles like this to educate myself for work and general interested and this post doesn’t give any information other than bad mouthing people. It’s not helpful or respectful. I always work with respectful and gentle care. And I don’t believe that crying it out etc is ok but supported crying is a totally different thing, crying is helpful to all people it helps release built up stresses etc. Not giving space to this is not allowing people to really feel. Children are in a life with their families, it’s very unhelpful to say that their sleep is that much more important then a parents, sleeplessness causes so many issues and if parents aren’t getting any and they need to implement safe and respectful sleep assistance I don’t think judging them is ok.